The information provided on this workspace is mainly around project accounting. Project invoices which are open, timesheets not posted and expenses that are still in review or just approved are some of the information made available on this workspace. The project accountant can also access the intercompany invoices too. Users having the role of Service industry super user, Service industry view role and Project accountant roles can access this workspace. Open invoice proposals This tile displays all the invoices proposals which are in status other than the cancelled and invoiced. Timesheets in review This tile displays all the timesheets which are in-review status. Expense reports in review This tile displays all the expense reports which are in-review status. Projects with created status This tile displays all the projects which are created status. Timesheets not submitted This tile displays all the timesheets which are either in the not created or draft status. Unposted timesheets This tile displays all the timesheets which are approved status but not yet posted. Approved expense reports This tile displays all the expense reports which are approved status. Pending inter-company in This list displays all the incoming intercompany transactions i.e. borrowing company is the logged in company. These transactions could be from timesheet, expense management and vendor invoice document types. Pending inter-company out This list displays all the out going intercompany transactions i.e. lending company is the logged in company. These transactions could be from timesheet, expense management and vendor invoice document types. Project invoices This list displays all the project invoices in various statuses. All open projects This list displays all the projects in open status i.e. projects which are not in finished\closed state. All contracts This list displays all the contracts created in the application for the logged in legal entity. All customers This list displays all the customers created in the application. Microsoft Dynamics 365 for Finance and Operations offers the ability to pin Power BI visuals into workspaces, an important functionality that seamlessly integrates two important business management systems in one platform. The workspace is the place where the user interacts with Dynamics 365 system for operations tasks. In order to more efficiently carry out the task, pinning Power BI visuals provides instant insight without having to toggle between systems. Inter-company customer invoice Opens up the inter-company customer invoices form for the user to see all the inter-company customer invoices created. Create project invoice proposals Opens up the create invoice proposal form for the user to create the invoice proposal for a single or multiple projects together. Project invoice proposal Opens up the project invoice proposals form for the user to see all the invoice proposals created in the application and status they are currently in. Project invoices Opens up the project invoice form for the user to see all the project invoices created in the application and other details around these invoices. Pending vendor invoices Opens up the pending vendor invoices list page to view and take action on vendor invoices that have not yet been posted. All missing timesheets Opens up the All missing timesheets. This list page shows all the timesheets that have not been submitted by the resources in the application are displayed on this tile. Hour journals Opens up the hour journals list page, showing all the hour journals posted as well unposted. By default the form will display the unposted journals, user can change the filter on the form to see posted journals. Expense journals Opens up the expense journals list page, showing all the expense journals posted as well unposted. By default the form will display the unposted journals, user can change the filter on the form to see posted journals. Item journals Opens up the item journals list page, showing all the item journals posted as well unposted. By default the form will display the unposted journals, user can change the filter on the form to see posted journals. Fee journals Opens up the fee journals list page, showing all the fee journals posted as well unposted. By default the form will display the unposted journals, user can change the filter on the form to see posted journals. Adjust transactions Opens up the adjustments form for user to create adjustment transactions. User can use filters to create adjustments for a specific project. Estimate to complete Opens up the estimate to complete process form to allow the user to run the process from this workspace. Earned value Opens up the earned value process form to allow the user to run the process from this workspace. Update resourcing ETC Opens up the update resourcing ETC process form to allow the user to run the process from this workspace. The below mentioned buttons are available on the selection of Pending inter-company in list page on the workspace. Open related transactions Opens up the details of the selected record under the All pending inter-company list page. The below mentioned buttons are available on the selection of Pending inter-company list page on the workspace. The below mentioned buttons are available on the selection of All open projects list page on the workspace. Open in PSA If the selected project in the list is integrated from PSA, then this button provides you the ability to navigate to that record in the PSA environment. Project budget This button opens up the project budget form to see and set up the project budget for the selected record on the list page. Create invoice proposal Opens up the create invoice proposal form to create the invoice proposals. User has to select project and project contract to create an invoice proposal. The below mentioned buttons are available on the selection of All contracts list page on the workspace. Open in PSA If the selected contract in the list is integrated from PSA, then this button provides you the ability to navigate to that record in the PSA environment. The below mentioned buttons are available on the selection of All customers list page on the workspace. Quotations Opens up the All quotations form to view the quotation information associated with the selected record. Projects Opens up the All Projects form to view the projects information associated with the selected record. Transactions Opens up the customer transactions form and shows the information associated with the selected record. 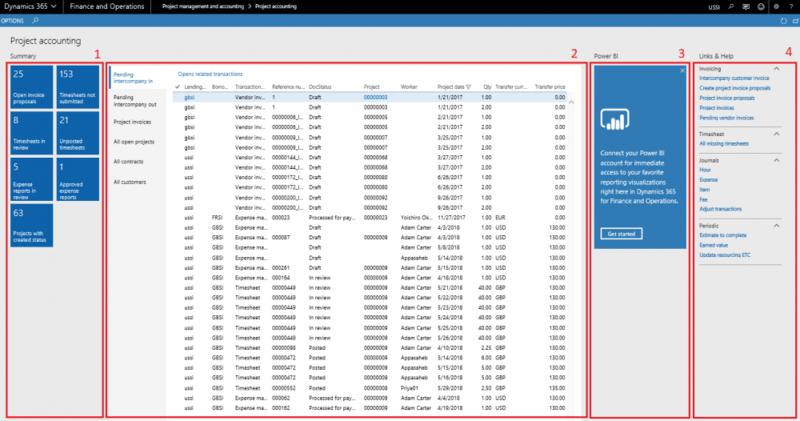 Project invoice Opens up the project invoices form and displays the project invoices against the selected record. Statements Opens up the project statements form and displays the project statements against the selected record. Open in PSA If the selected customer in the list is integrated from PSA, then this button provides you the ability to navigate to that record in the PSA environment.